Browser exploitation is continually getting more challenging as defenders constantly introduce new protections, moving the goal posts further and further away. Memory corruption on the latest Internet Explorer is now not a task for the faint hearted with improvements like MemGC, Isolated Heap and Control Flow Guard. Life would be much simpler if we could just tell the browser what we wanted to run, and it would run it. There are a few things stopping us doing this, but for the purposes of this blog post the one we’re interested in is Protected Mode. “In general, extensions should operate as low integrity processes whenever possible. This provides the best protection against malicious attacks. However, there are times when an extension may need to access medium or even high integrity objects. One such extension that requires elevation and runs outside of Protected Mode is HTML Applications (HTA), which when opened will display a warning that may scare off many users, assuming no elevation policy is in place, as shown at the top of this article. To avoid code execution, the user simply has to click “Don’t allow” to dismiss the warning and stop the HTML application running, right? Unfortunately not! 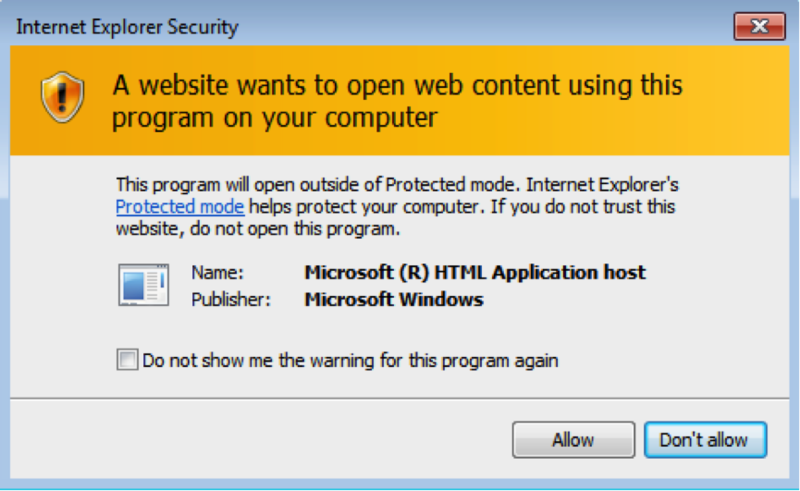 During a research project we discovered an elementary weakness in Protected Mode, which meant the HTML application would still be run, regardless of whether you selected “Don’t allow” or dismissed the warning using the “X”. Consequently, this means that if a user opens a HTA file, served up through a drive-by-download or other means, the only way to prevent arbitrary code execution is to forcibly kill the browser process! In the video above, we used a default Windows 7 x64 install running the latest version of IE11 and the calc.exe process is spawned in medium integrity. It is possible that other extensions (e.g. SCR, VBS?) may have a similar effect; this is left as an exercise for the reader. This blog post was written by Dominic Chell.